Hi, everyone! How was your weekend? Did anyone race? 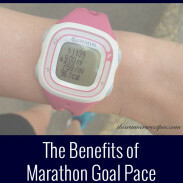 Today’s post is part of an on-going series on many key aspects of marathon training. You can find previous Marathon Monday posts here. While I know for some of you would classify this as low mileage, the Hansons Marathon Method has me running my highest mileage ever. Currently, I’m running 50-60 miles per week as I approach the peak of my training for the Portland Marathon (less than five weeks to go!). The Hansons Marathon Method (which peaks at 63 miles on their advanced plan) is not alone in prescribing a high volume of miles to its marathon runners. Pete Pfitzinger’s Advanced Marathoning has plans that peak at 55, 70, 85, and more than 85 miles per week. Elite runners will log 130 or more miles per week as they prepare to race their goal marathons. Why so many miles per week in marathon training? Within the past fifty years, the running community has accepted the axiom that the more miles you run, the better of a runner you become. This notion emerged from the work of coach Arthur Lydiard, who had even his middle distance athletes run 100 miles per week in training. The longer the race, the more miles his athletes ran, and the results quickly made this the standard of distance training. In fact, a quick survey of marathoners’ training logs and finish times will demonstrate a direct correlation between training volume (miles per week) and marathon finishing time. The more miles you run, the faster you complete the marathon. Why is this? In short, the benefits of high mileage during marathon training are physiological, neuromuscular, and mental. However, it is not a linear progression, as each individual runner has a threshold where they encounter diminishing returns and the risk of injury. There are two ways to improve your running: run your current amount of mileage faster, or run more miles. The former can lead to injury and only yields potential to a certain point, while the latter offers more potential growth and longer sustainability. Higher mileage done at an easier pace will increase your aerobic capacity, thus preparing you to run any event from the mile to the ultra marathon. How does running more help you run faster? Endurance training (longer runs at an easier pace) increases your capillary density, mitochondrial density, and red blood cell and hemoglobin levels. As these increase, your body becomes more effective at transporting oxygen through your bloodstream to your muscles. The more oxygen your muscles can get, the farther and faster you run. A higher training volume also causes your muscles to store more glycogen (fuel) and utilize intramuscular fat more efficiently. 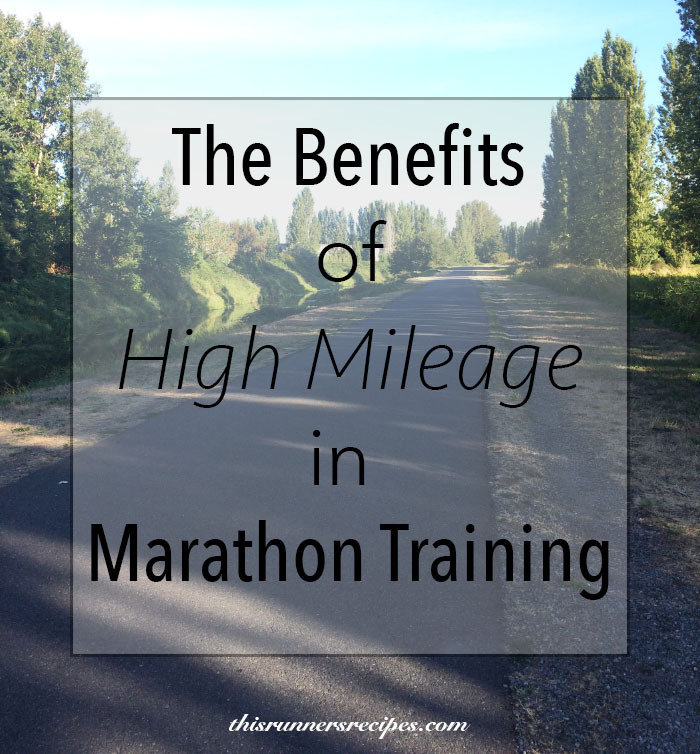 The benefits of high mileage during marathon training will help you get oxygen and glycogen to your muscles faster and thus run farther, faster, and more efficiently. Many sports physiologists point out that aerobic capacity no longer improves once most runners reach 60-70 miles per week in training. Why do some runners, especially professional runners, continue to run more? The answer is running economy. Running economy is how efficiently your body uses oxygen while running; the more you run, the less oxygen you need to maintain a given pace, such as marathon pace. Maintaining marathon pace will feel significantly more manageable on race day if you consistently maintained a high training volume than if you were sporadic in logging miles. 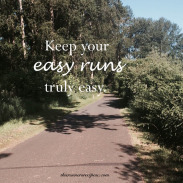 The more miles you consistently run, the more your body neuromuscularly adapts to running. Think of the old adage that practice makes perfect: this applies to running just as much as music or math. The more you run, the more time you spend practicing your strides. High mileage marathon training will develop a more efficient stride and thus keep you running strong even past the 20 mile mark. Running a high number of miles per week during marathon training will also strengthen your mental capacities for racing. Fatigue is as much a mental perception as it is a physical sensation. Matt Fitzgerald states in 80/20 Running that long efforts at an easy to moderate effort induce more fatigue than shorter, intense efforts. By frequently running longer but easier efforts (as you do in a high mileage training plan), you condition your brain and your body to withstand the discomfort of fatigue. How Many Miles Per Week Should You Run in Marathon Training? So, how many miles should you run per week in marathon training? Before we answer this question individually, let’s look at what some experts have to say. The renowned exercise physiologist Dr. Jack Daniels recommends that you should run as many miles as you can personally handle without getting sick, risking injury, or getting bored or mentally burnt out. Of course, as your body adapts to distance running, you may find you can handle more miles as you complete more marathons. Dr. Tim Noakes, the author of Lore of Running, suggests 75-100 miles per week as the maximum training volume. The faster you are, the more miles you can run, since you spend less time running per mile. You want to avoid making significant increases in your weekly mileage, especially if you are including any speedwork or tempo runs. It’s not advisable to jump immediately from 35 miles per week to 55 miles; instead, gradually build up your mileage a few miles at a time, with a few weeks at the same mileage to allow your body to adapt before the next increase. Most of all, since each runner can sustain a different training volume due to personal training background, goals, injury risk, your schedule, and overall health, you want to consult your coach and other health professionals before dramatically increasing your weekly training volume. Talk about high mileage! This week I ran 59 miles. It should have been 62, but I just struggled this week. Cumulative fatigue definitely is taking its effect on me, and our hike at Gothic Basin left me feeling sore and tired at the start of the week. On paper, I had a strong training week: I hit my paces consistently, even down to the same pace and effort for all my easy runs. This week, however, was definitely a test in mental strength. Monday: 5 mile hilly easy run, 9:38/mile, and 15 minutes of Pilates. Tuesday: AM: 10 miles: 2 mile warm-up, 3 x 2 miles at half marathon effort (7:37, 7:36; 7:34, 7:33; 7:32, 7:29), 1 mile cool down. PM: 30 minutes of power yoga. Wednesday: 8 miles easy on the treadmill, 9:30/mile, 0-2% incline. Thursday: 12 miles: 2 mile warm-up, 9 miles at goal marathon pace (7:49/mile average pace), 1 mile cool down. I ran this more by effort than pace and was very pleased to see my splits: the first four were in the 7:50-7:55 range, the next 4 were in the 7:45-7:49 range, and the last one was a 7:33! Friday: 8 mile hilly easy run, 9:34/mile, 15 minutes of foam rolling, and 15 minutes bodyweight strength training. Saturday: 16 mile long run, 8:45/mile. Due to heavy rain, I did the first 10 miles on the treadmill and then immediately headed outside once it cleared up for the 6 last miles. Not a fun run, but I got it done and kept the right pace. No hiking, because of high winds on Saturday. Most of the greater Seattle area lost power for 12-20 hours, including our apartment complex. Sunday: Complete rest day. Napping. What is your highest mileage during training for a peak race? How have you adapted your training since you began running long distance races? How was your training this week? Great post Laura. 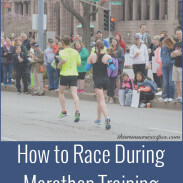 You are really getting the understanding down behind marathon training, and it will serve you well. I am excited to see how you get on, it sounds like you are approaching this with a good mindset 🙂 Keep it up! My highest mileage week was 95, and I felt like a rockstar! I’ve hit some of my highest cumulative mileages of training this past 2 weeks and I’m extremely happy with them! But I also know my body well enough to know that I cannot do that for this week–elites might be able to do all the miles, but my little body isn’t built for that. But I’m just trying to continue to enjoy what I”m going, and hoping my body stays healthy and happy as well! Congrats on getting your highest mileage weeks! Hopefully you continue to stay happy and healthy over the next few weeks of training! I’ve been hitting about 60+ for my peak weeks. It seems as though the idea of cumulative fatigue has been the most helpful in my training for marathons. For my first few marathons I peaked around 40 and incorporated more cross training, but I believe that altering my training schedule to “run on tired legs” has been the best for me. 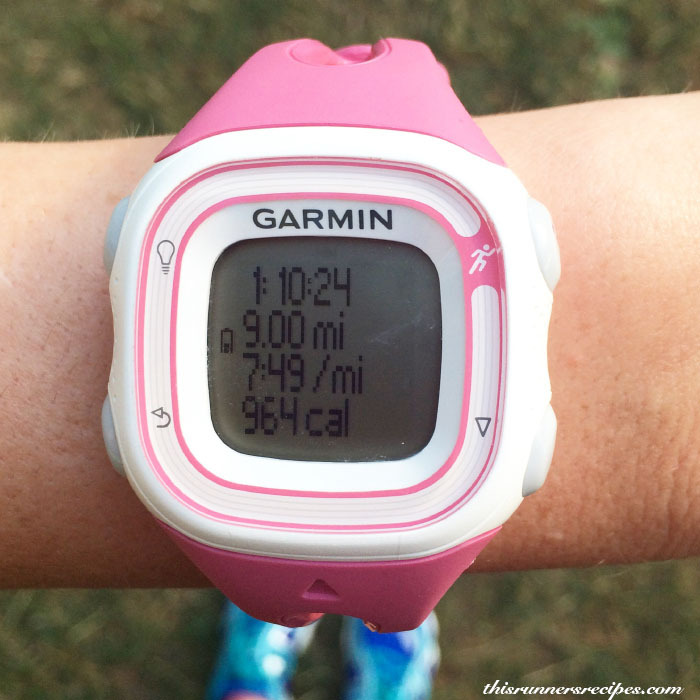 60+ miles for a peak week is very impressive – no wonder you’re so fast! During my first two marathons I peaked around 40 miles. When I followed Hansons I hit 63, which was my highest ever. Now I usually aim for the mid 50s. I think one of the biggest parts of being able to handle high mileage is keeping the easy runs really easy! Yes, easy runs have gotten very easy for me! I think that’s the key, otherwise high mileage is mentally and physically too hard. You’re doing AMAZING! You’ll kill that marathon. Your training has been incredible! I hit 80-100 miles in peak marathon training, but I’ve been marathoning for nearly 20 years. Thank you so much! 🙂 Your mileage is seriously impressive – and so’s your speed! This is so interesting, because it is the exact opposite of how I”m training. My body just can’t handle the high miles. I wrote a post about older runners and marathon training, and the thought is to incorporate more cross training/intervals into our training. My highest mileage week was 38 last year, but I PR’d that marathon. We’ll see how it goes this year! 38 miles is still pretty high! I do think there is very much a balance and there’s a lot of runners who run well without lots of miles, which in part is what makes mileage interesting – it’s not a direct correlation. I’m betting you PR this year because you are doing amazing at all of your training! I need to get my mileage just a tad higher, but it’s been a weird/busy training season. I hit over 40 this week and I’m almost at peak week. I know my body likes some strength training and easier runs. Maybe next training cycle I’ll aim for more miles! Nice job on hitting 40 miles! I think it’s always smart to take what we can each training cycle and then plan on more next time – that way we’re never burning ourselves out. Thank you! I feel like it’s so relative sometimes, since other runners 25-100% more than what I do. I hope you have a great week! The most miles I’ve done in a week was 55. I don’t know if I’d ever get to Noakes recommendations. Yowzers! 55 is really impressive! Noakes’ recommendation is super high – that’s at least 10 miles a day! I find that doing 2 workouts separated by 5 to 8hrs apart, allows my body to handle 42 miles a week. That is 3miles in am and 3 in the pm. I will try to raise it to 70mpw at some point but i have to tread softly to prevent any injuries. Now a 720 mile training pace seems to work well for me but sometimes when tired i will run a pathetic 8min pace. My goal is 7min training pace but only if i lose another 15 to 20lbs off my 170lb body. I am hopefull. My marathon goal is either sub 3hrs or if i am lazy 307. But that is me. I am a high achiever.